I have a 3-year-old Kenwood receiver in my car that has iPod support, but no way (I thought) to connect my Android phone. I read something somewhere a few weeks ago about Bluetooth receivers and went to Amazon to check them out. I wound up buying this GOGroove BlueGate receiver – it’s tiny, only about 1/4″ thick and less than 2″ long. 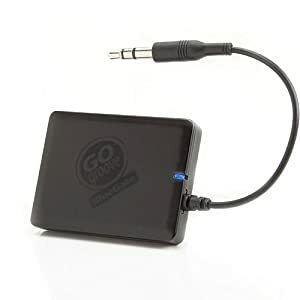 It plugs into the AUX jack on the front (thankfully) of my stereo; then I turn on Bluetooth on my phone and pair the devices and suddenly I can listen to the ShopTalk and The Instance podcasts in the car. Excellent. And cheap, too, it was about $30 at Amazon last week.